Take a tour of our Dynamic CAD Engine. The Thomas cloud-based platform doesn't just ease the data maintenance process — it also helps your business expand to new distributors and sales channels. 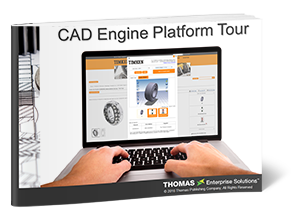 See for yourself in our CAD Engine Platform Demo: you'll discover how the platform combines easy product navigation and rich CAD files to deliver a complete digital customer experience. Fill out the form on the right to gain access to our free Platform Demonstration.